News | Haven Fire & Safety L.L.C. Haven Fire and Safety will be exhibiting at this year's Intersec Show at the Dubai World Trade Centre from January 20th to 22nd. Come and visit us on Stand F40 in Hall 7 where we will be showcasing our range of Globex Evacuation Chairs as well as our other brands of fire, security and safety products and systems. Globex Evacuation Solutions provide Evacuation Chairs to ensure the safe evacuation of mobility impaired persons up or down stairs when lifts cannot be used in an emergency, power failure or during lift maintenance. See our Globex Product Page for more information.. The use of Evacuation Devices, such as our range of Globex Chairs, is a requirement within the Dubai Universal Design Code and applies to all properties, new or existing, above one storey in height and forms part of their Municipality Approved Evacuation Plan. Compliance to the code is mandatory under law to ensure accessibility for all within any building in the UAE and is also detailed in the latest edition of the UAE Fire & Life Safety Code of Practice. Whether you are a buidling owner/operator, facilities management company, School, Hotel, Airport or Sports Venue, the code applies to you and we would be happy to discuss this in more detail, to help you ensure you become compliant! 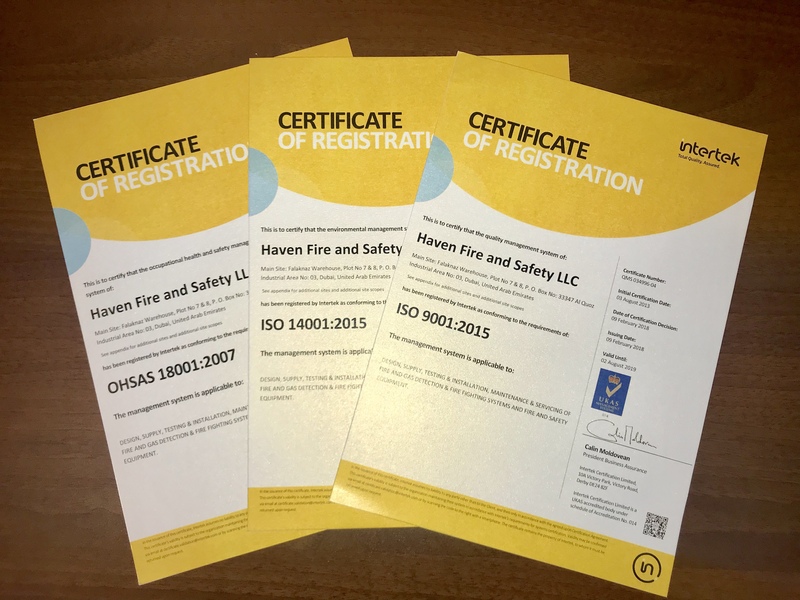 Haven Fire & Safety is delighted to announce that its QHSE Management System has successfully been certified to ISO 9001:2015, ISO 14001:2015 and OHSAS 18001:2007. Having long been a leading provider of World Leading Products and Services in the Fire Industry, Haven Fire & Safety remains committed to providing the highest level of Quality, Environmental and Occupational Health & Safety Management and continues to invest in, and adhere to, the latest International Standards. "The recent update of our Management System to the latest editions of ISO 9001:2015, ISO 14001:2015 and OHSAS 18001:2007 demonstrates the commitment from the Haven Fire & Safety Management Team to ensure all aspects of the business are managed professionally and in line with International Standards and compliance to Legislation. 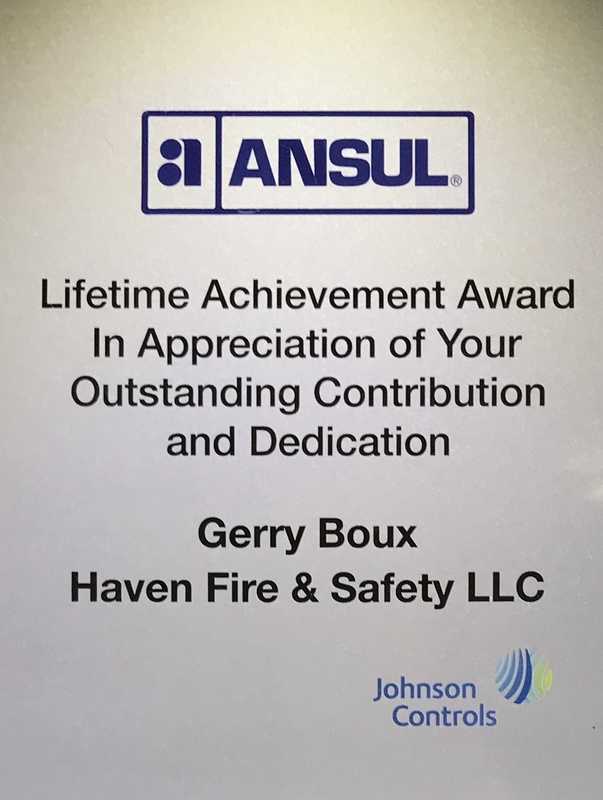 We continue to invest in our people, operations and technologies to help drive our business forward and aligning our processes with the latest Management Systems enables us to monitor, measure and improve on our day to day activities"
We are absolutely delighted to announce that our Managing Director, and founder of Haven Fire & Safety, Mr. Gerry Boux has been presented with a Lifetime Achievement Award from our partners at Ansul, a leading fire protection brand from Johnson Controls Inc.
Having founded Haven Fire & Safety in 1997, Ansul was one of the very first brands that Gerry partnered with and for the last two decades, has enabled Haven to become the leading Restaurant and Kitchen Fire Protection System Company in the UAE. The award was presented to Gerry at Ansul's recent Distributor Event in Leipzig Germany, where he was recognised in front of other leading distributors and Ansul senior management, for his dedication and support over the last 20 years. 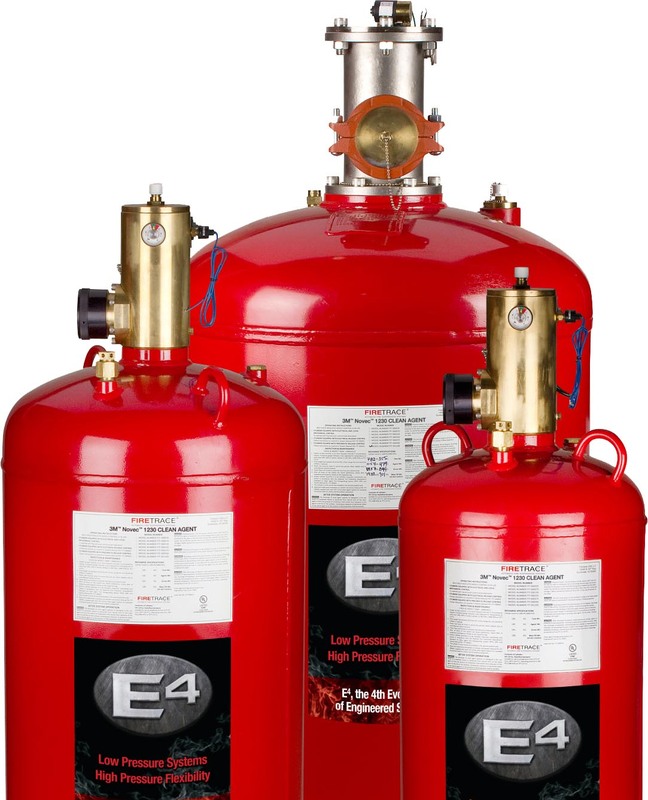 As well as designing, supplying and installing Ansul R-102 and Piranha Kitchen Fire Suppression Systems throughout the UAE, Haven Fire & Safety also offer full service, maintenance and refilling works in line with International Standards and the UAE Fire & Life Safety Code of Practice. 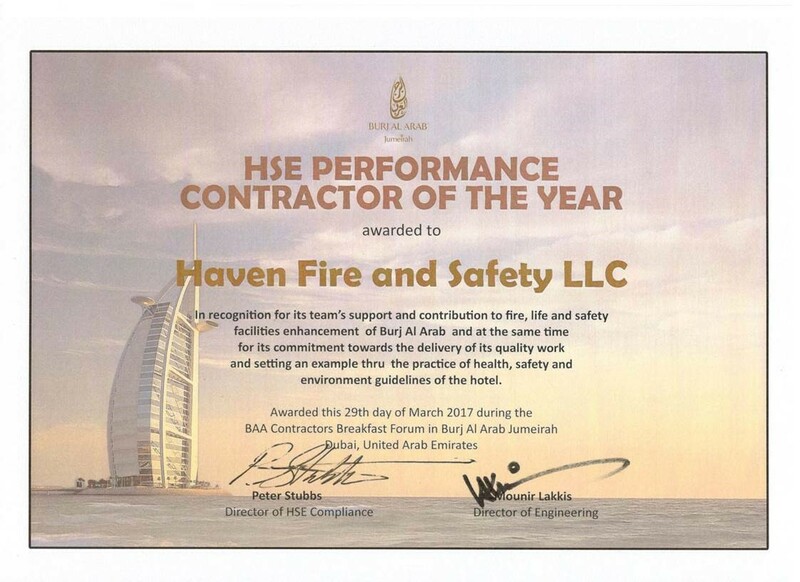 We are delighted to have been awarded the HSE Performance Contractor of the Year Award for 2017 from the Burj Al Arab! Congratulations go to our team for their continued delivery of world class products and service, ensuring everything we do adheres to our core values of always providing excellence and quality to our clients. We are delighted to announce that we have successfully achieved UL Listing as an alternative manufacturing location for Firetrace's range of Engineered Clean Agent Systems using both FM-200 and 3M Novec 1230. This UL Listing enables Haven Fire & Safety to carry out the assembly, first filling and refilling of Firetrace FM-200 and E4 Novec 1230 Engineered Systems in line with the UL procedures and processes followed by Firetrace International in their existing manufacturing facilities. Firetrace International, perhaps best known for their micro-environment, tube operated systems now manufacture their FM-200 and E4 Novec 1230 systems for protecting larger environments such as Data Centers, Archive Stores, Control Rooms and Electrical Rooms and offer a number of unique advantages over other commercially available systems such as systems that require less piping, deliver lower installation costs and allow for system designs that were previously only achievable when using higher pressure systems. By successfully gaining this UL Listing on our Clean Agent Facility, Haven Fire & Safety continues to be one of the leading providers of quality and approved fire protection systems in the United Arab Emirates and surrounding Region.